With Cold & Flu season right around the corner this deal is great! 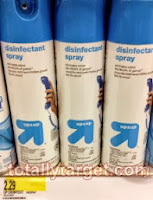 Right now at Target you can pick up Up & Up Disinfectant Spray for as low as $0.75! As low as $0.75 after coupon & cartwheel!